spirituality | The Better Plan . .
You’re Adding PURPOSE on Purpose? Some of you noticed that I have added Purpose as an additional need to the five Glasser identified. It is true, and I not only added it, I put it at the top of the list. I did not do this flippantly. Instead, my suggesting this new addition represents a very personal process involving a great deal of reflection. 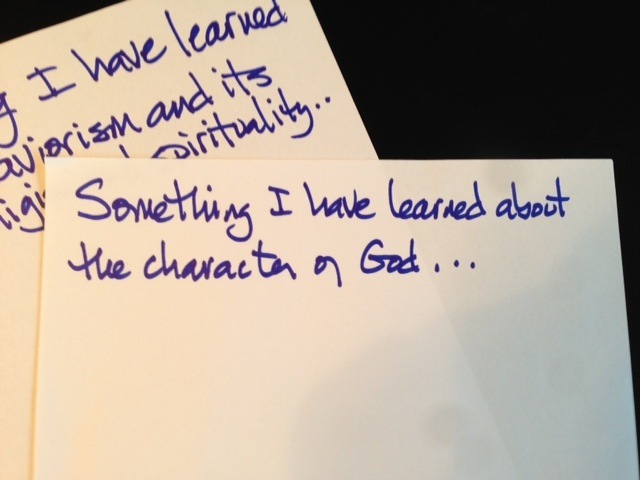 The thing that started this personal process was my wondering where my spirituality fit into the Basic Needs. And by spirituality I mean something much deeper than religion or church orientation. My spirituality has to do with Who I really am and What are my deepest beliefs and What is the meaning of life (it’s beginning and it’s end) and ultimately, What is my purpose in the grand scheme of things? 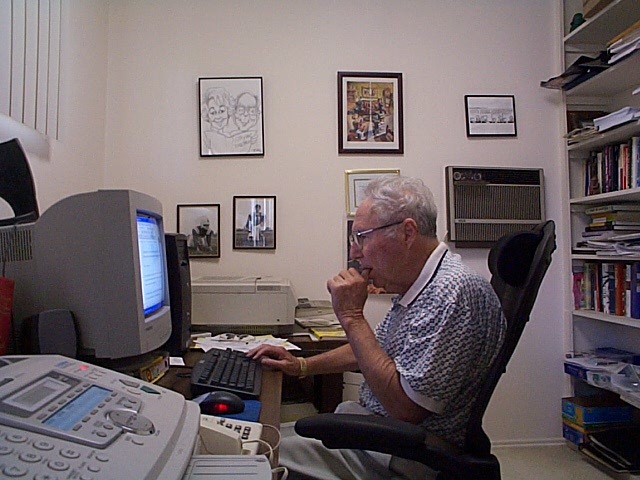 William Glasser at work in his home office. (2004) Jim Roy photo. I tried to talk Glasser into endorsing this additional need, but he wouldn’t buy it. (When I first talked with him about it I referred to it as an Existential need, thinking he would be more comfortable with a “secular” wording.) I think he didn’t endorse the Purpose need for two reasons. The first reason had to do with not wanting to mess with the five needs he had emphasized for so long. Even though he had suggested the probability of their being more than five needs in his earlier writing (Control Theory, p. 16), he had settled into a firmness with his five. The second reason, I think, had to do with his seeing religion and spirituality as the same thing. He saw religious participation as a Quality World value or activity, and as such it didn’t qualify as a Basic Need. On top of this, in general, he didn’t view religion as a positive force throughout earth’s history. Without his endorsement I put my thoughts on this on a back burner and worked on other things. Even on a back burner, though, for me, the Purpose need wouldn’t go away. I am convinced we are driven to understand our personal purpose and to make meaning of our lives, and that meeting this need is essential for the other needs to be fully met. For a need to qualify as a Basic Need it would have to be needed, at least to a small degree, by all human beings. I believe the Purpose need meets this criteria as every human being has a deep need for personal meaning and the idea of coming into a sense of self. The self-help quest (books, seminars, videos, etc.) is an industry bringing in 2.5 billion dollars a year, so there are a lot of us seeking this thing called meaning. I see college students that struggle because their life purpose is not clear to themselves. Their other needs are being met – they have friends and social connections, they are free to come and go, and they have some fun in their lives – but not having their identity and purpose clarified hampers their success. In fact, a lack of purpose can derail a college student’s academic success. I am suggesting that the need for Purpose and Meaning is a universal need that people seek to meet in all kinds of ways. For many their involvement in a religion contributes to filling this need; others who are spiritual, although not into a religion, find meaning in their journeys as well. And even non-spiritual, non-religious people have their own ways of finding purpose and meaning. 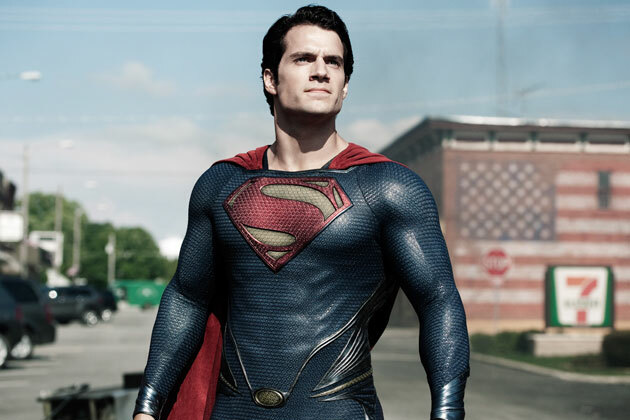 For instance, it is interesting how movies that depict superheroes, science fiction stories based on “a long, long time ago, in a faraway galaxy” themes, and end-of-the-world scenarios are so popular. It is like we have an innate curiosity about where we fit into the past, present, and future. It is like we have a consciousness void inside of us that can only be filled as our need for Purpose and Meaning are satisfied. We are always monitoring the extent to which our Basic Needs are being met, something I do quite a bit when it comes to my own need for Purpose and Meaning. Maybe some of you can relate to that. For those of you just getting started with following The Better Plan blog, a great way to catch up is to go the link toward the upper left hand corner labeled 2013 – Year At A Glance. Each of last year’s posts are in chronological order and just a click away from accessing. The Screwtape Letters (C.S. Lewis’s 1942 classic) pulled back the curtains that shield us from Second Heaven and revealed conversations that occurred between an uncle and his nephew. Both of them were demons and as such both of them were in the business of tempting human beings toward wrong turns and wrong lives. 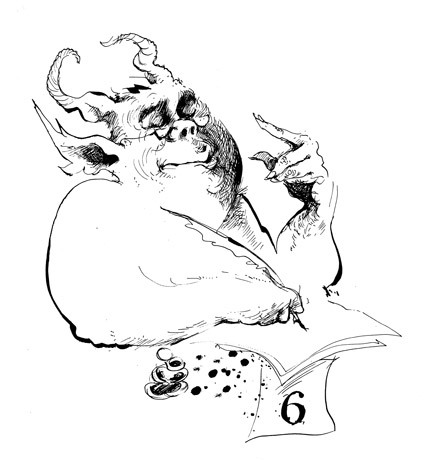 Uncle Screwtape coached and counseled his nephew, Wormwood, as the younger tempter struggled to influence the life of the human to which he was assigned. It should come as no surprise that one day Wormwood himself would become the coach and pass on his knowledge to a younger relative, in this case his grandson, Maggot, a fledging tempter trying to learn the ropes. How touched I am that our communication is deepening and that you are so willing to lay open your thoughts and your struggles regarding your tempting strategies and the apparent lack of success that you are thus far experiencing. Honesty is not a trait that we demons display with any consistency, so I commend you for your candor. This openness will assist me as I counsel you toward more effective approaches. Keep in mind, too, that you are planting seeds of discouragement and resentment that will grow in due time. Be patient with your patient. Remember that you are in the business of making others discouraged, not in getting discouraged yourself. In your recent letters you have shared so many details – your patient’s tendency to seek the Enemy, to want to be close to him, to want to get involved with helping others – which are all serious problems that need to be dealt with. However, it seems to me that in rushing from a tree here to a tree there, you are missing the bigger forest. Frustration over individual details are keeping you from seeing the bigger picture. Not that these details are unimportant. It’s just that seeing the bigger picture first will serve as a foundation from which to launch a more effective attack. First, and I think you already know this, it is absolutely vital that you cloud and confuse the choice-power of your patient. This theme – the ability of humans to make effective choices – is rampant throughout the Enemy’s manual, yet so few humans really pick up on this. The minute they stray from this awareness we have them. For if they aren’t in the process of choosing, the alternative is that they are victims of circumstances, tossed to and fro by their tumultuous feelings. I smile just thinking about it. You and I both know that these disgusting little humans have been created in the image of the Enemy, with amazing internal guidance systems, but this must be hidden from them. At all costs. You may at first question what I am about to write, but write it I must – religion is not our enemy. In fact, humans can be messed up by a lot of things, but nothing can mess them up as much as religion can. Paul (the turncoat) realized this when he wrote about the Enemy’s domain being about a lot of talk versus being about real power. Let his words be a lesson to you. Shower your patient with religion, let him marinate in its rules and habits and schedules. Just be sure to keep him in the realm of talking, and studying, and behaving. There are so many benefits from this focus! Where do I begin? + One of the supreme benefits from the “lot of talk about religion focus” is its effect on their young. I savor this result as much as any of our victories. You would think they would have figured this out by now, but no, they continue to emphasize habits and lifestyles and right living. Let them talk, encourage your patient to talk. The fact is, and we must say this quietly, their young wouldn’t walk away from real power (who would? ); their young walk away from talk. I’m almost laughing as I write this. Here they are desperate for power and they refuse to simply plug into the Enemy’s vast resources. It’s too easy, really. + Lastly (at least for this letter), without being connected to the power, religious humans lose sight of, and even move in the opposite direction of – I hate even to write the word – love. Based on what the Enemy has done for the wretched things you would think that christian would be a wonderful word to them, a cherished concept. Yet look at what the word christian evokes in people now, especially in that place they refer to as the United States. (united? lol as they would say) When humans hear that word now they often think about pictures of self-righteousness, political posturing, and meanness. This is a victory that must be placed near the pinnacle of our successes! One of the Enemy’s writers, that awful little Ellen White, explained this process perfectly, yet fortunately she may as well have been writing to a wall. I was worried, even scared, when I first saw what she had written, thinking that the earthlians would “get it” and head back onto the Enemy’s path, but I was soon reminded my fears were unfounded. They are more into being right, and making others be their view of right, than they are in being connected and (forgive me) loving. Keep your patient focused on the value of rightness. Prompt him to be willing to sacrifice others for the good of the right. And by all means, present to him the importance of religion and the value of knowing, dissecting, and being right. I apologize for my droning, yet I remember with such affection the counsel I received from my Uncle Screwtape when I, like you now, needed it most. You are my cherished grandson and I yearn for your success. I look forward to more of our discussions. P.S. – I know that you wanted me to specifically help you with a concept your patient is studying called choice theory. You are correct to be concerned about this. Hopefully, you can see how my letter begins to address these concerns. The concepts of choice theory are part of the Enemy’s way and I am glad you discerned this on your own. More on this later. 2. White, E. (1896). Thoughts from the Mount of Blessing, (p. 126-127). Takoma Park, MD: Review & Herald Publishing Association. It is one of the most significant of all human qualities – that being the ability to forgive. I was reminded of this truth from a remarkable source – Newtown, Connecticut. My cousin, a school administrator in New York City, knowing of my interest in choice theory, recently sent me an article* written by Dr. Anthony Salvatore, president of the Newtown Association of School Administrators. 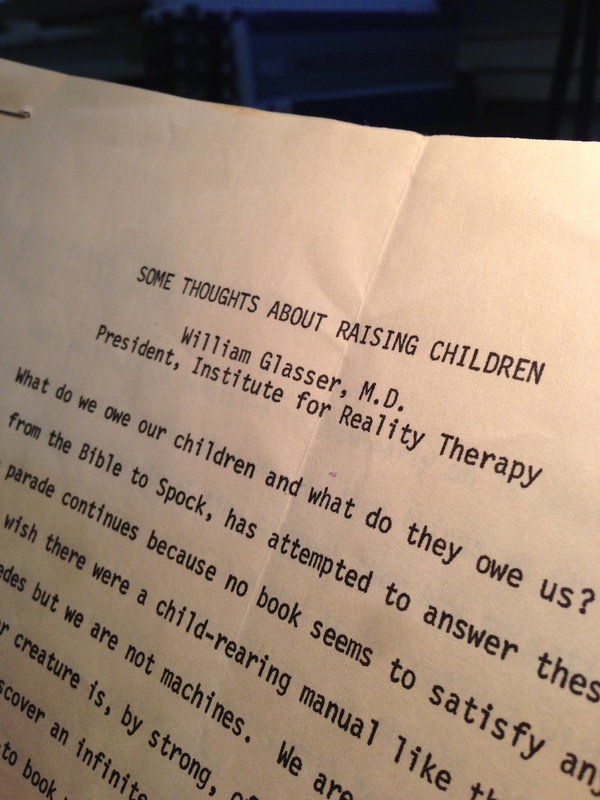 It turns out that Newtown schools, including Sandy Hook Elementary School, have been studying and implementing the ideas of William Glasser and choice theory since the early 1990s. 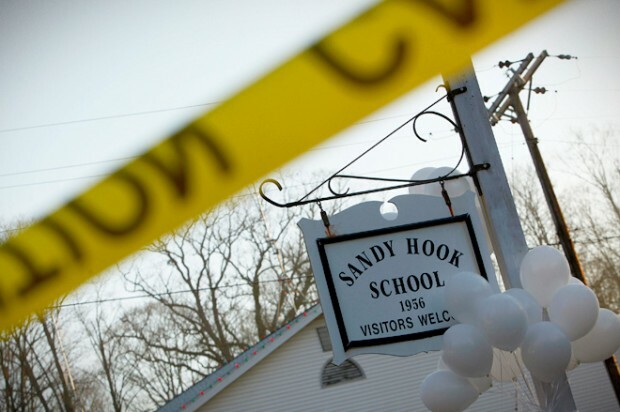 As a result, Newtown has sought to be a needs-satisfying school system for students. In the aftermath of the unspeakable tragedy that occurred at Sandy Hook Elementary, Dr. Salvatore represents a voice of healing. Even his comments about the shooter reflect compassion. Salvatore emphasized the need for schools to build positive relationships with students “so they can learn how to make the best choice for meeting their own needs and for helping others in society meet theirs as well. Building on the value of relationships and choice, he closed the article on a note I will not soon forget. His vision of forgiveness is more than inspiring! May Dr. Salvatore’s words be an invitation and inspiration to each of us. May the Spirit work in us to prepare our hearts to respond to others, even those who do us harm, with similar compassion. Forgiveness is such an essential part of good mental health. Within the scheme of choice theory, though, where does it fit in? Which of the basic needs, for instance, are being satisfied when we forgive someone? My mind quickly goes to the need for love and belonging. Forgiveness has to do with our relationships. We seek forgiveness, whether from an earthly friend or our heavenly Father, to restore a relationship. And we offer forgiveness for the same reason – to restore or maintain a relationship. What about the other needs, though. Does forgiveness satisfy the need for power in some way? How about the need for freedom? How about the need for joy and fun? And we shouldn’t leave out the physiological need for survival. Does forgiveness impact us on a physiological level? I would like to hear from you regarding forgiveness and the basic needs. How does forgiveness help us meet our psychological or physical needs? A few of us have started a Facebook page also called The Better Plan. We want it to be a collecting point for choice theory ideas and strategies. I invite you to join us. An article was posted today from a primary grade teacher who has just learned about choice theory on how her management is going to change this coming school year. Great stuff! Check it out. 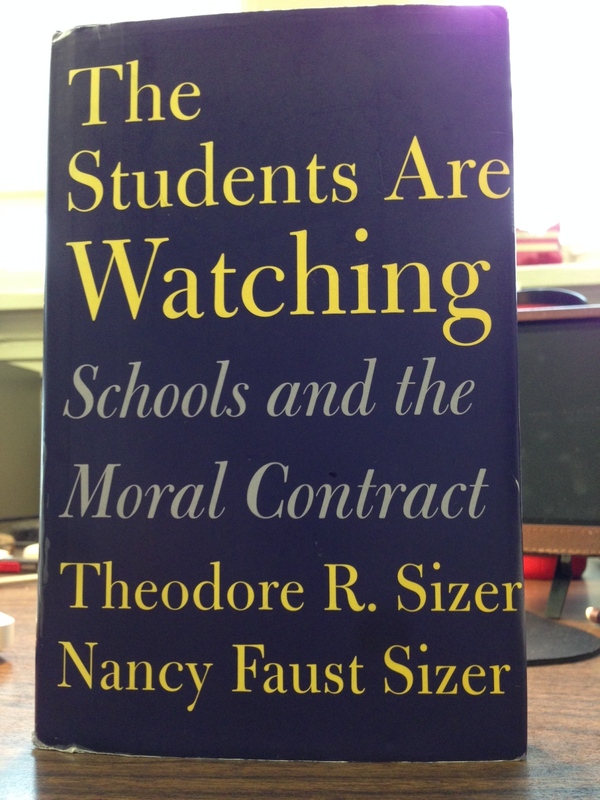 * This article appeared in the Summer, 2013, edition of The Leader, the newsletter of the American Federation of School Administrators. The topic of control is a big deal! Many of us commit a lot of energy to trying to control others. This is a discouraging process that drains us emotionally and physically. Most importantly, trying to control others, usually the people we want to be the closest to, hurts our relationship with them. I feel there is a good chance that this “control” process is almost single-handedly responsible for the ridiculously high divorce rates. We also commit a lot of energy and effort into trying to control ourselves. If we believe in a reward and punishment approach to life, and if we are using reward and punishment to try to control others, we will use those same tactics on ourselves. And, as you may have learned from experience, with pretty much the same ineffective results. In the same way that external control negatively affects our relationship with others, an external control approach negatively affects the relationship we have with ourselves, too. As self-control seems to elude us, we come to resent and even loathe ourselves. With today being a Sabbath, a day of rest, our blog today will focus on some of the spiritual implications of control. 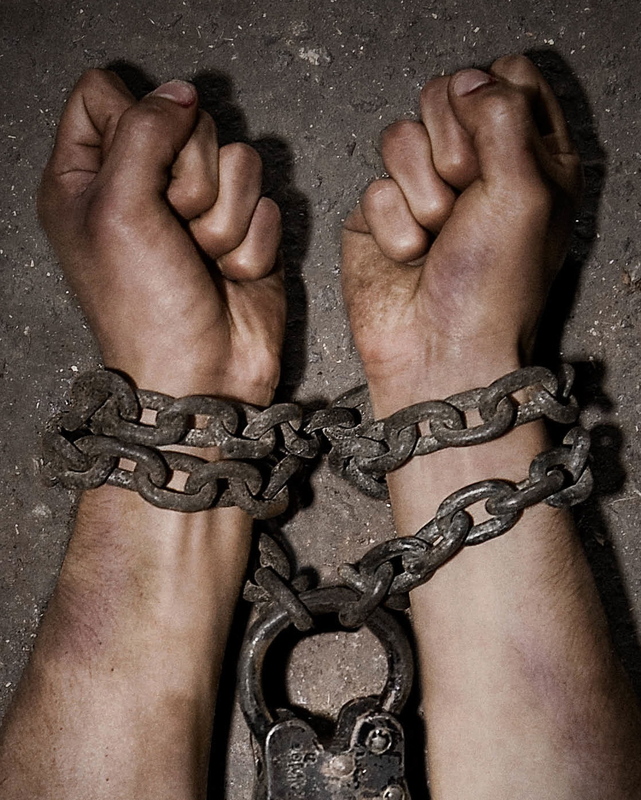 Peter agreed that “you are a slave to whatever controls you.” (2 Peter 2:19) And a little book called Steps to Christ explains that “What we do not overcome will overcome us.” (p.33) Regardless of our culture, nationality, or religious background, this is what human beings are up against. Either we are becoming more trapped within our own physical and psychological appetites, feeling almost like we are in chains to silly or destructive habits, or we are becoming more free, more in control of our thinking and our acting. The seventh-day Sabbath is known for being a Jewish custom, but this is not entirely correct. Jewish people do observe Saturday Sabbath, however I am not Jewish, yet still observe this weekly gift of rest. The Sabbath was instituted at the creation of the world, before there were any nationalities or cultures. The Sabbath was included in the Ten Commandments many hundreds of years after creation, but the wording is significant. “Remember the Sabbath day,” the fourth commandment reminds. It wasn’t something new for the Hebrews after leaving captivity. The Sabbath was a day that God gave to all creation as His special gift. Even in the perfect world He originally created He must have known it would be good for us to truly rest one day out of seven. With the entrance of sin into the world and the pressures it brought to bear on us, His gift is all the more important. “Take it easy,” He gently encourages us. “Come apart from your busyness, your worries, and your to-do lists. Let’s hang out together during this special day.” After all, the earth is God’s coffee shop. Steps to Christ, by Ellen White, is an incredible book on spirituality and the power of choice. Is Choice Theory in the Bible? The ideas of choice theory have appealed to me a lot. 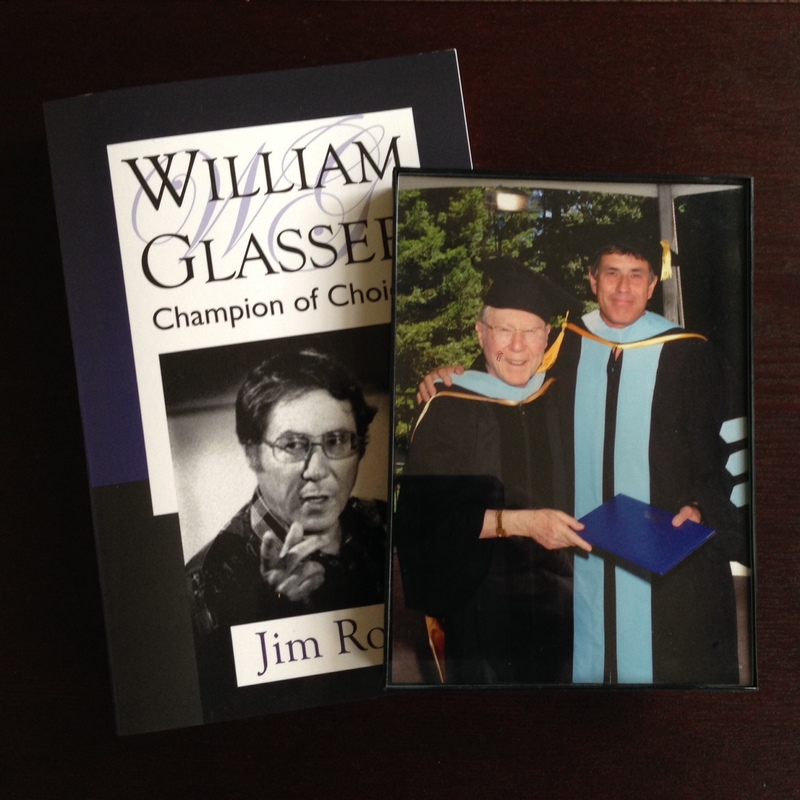 Initially, I the appeal had to do with my belief that choice theory ideas would improve the school at which I was a principal. As I learned more about the ideas, though, I came to see that they were deeper than mere school improvement, as important as that goal is, and that similar to a C.S. Lewis phrase out of Narnia, choice theory involved “deeper magic.” In other words, unintentionally, Glasser had stumbled onto spiritual principles as his therapeutic strategies took form. I have thought about choice theory and its comparison to spiritual principles a great deal and thus far it has appeared to me that they consistently strengthen and support one another. Choice theory is not a gospel in itself. Choice theory describes and explains human behavior, but it doesn’t empower. It can explain, as our last blog did, how a person can repeatedly choose an unhealthy way to meet a need, yet this insight does not necessarily bring about change. Scripture is full of choice theory, yet religionists have missed it. So many of us church-attenders have not come into a knowledge and appreciation for our own role in making good choices, in believing, in having a saving faith. Many are waiting for God to change them from the outside-in, like a giant puppeteer, but alas, they’re still waiting. So, anyway, I think the two – the principles of choice theory and the principles of Scripture – can help each other. 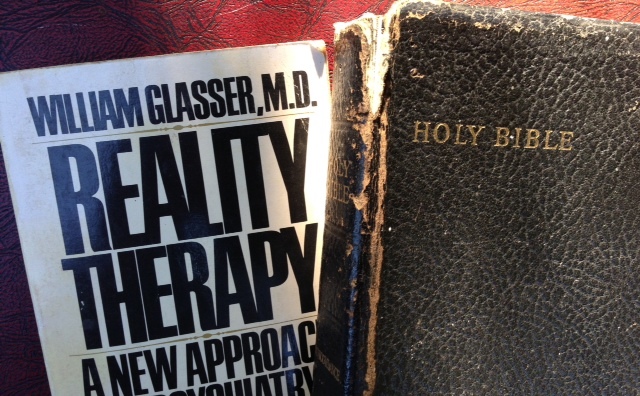 Over the years I have been collecting Biblical texts that speak to or support choice theory components. What follows are texts that speak to each of the basic needs. Glasser settled on five basic needs – survival, love and belonging, power, freedom, and fun – although in Control Theory (1984) he allowed for flexibility in this list. 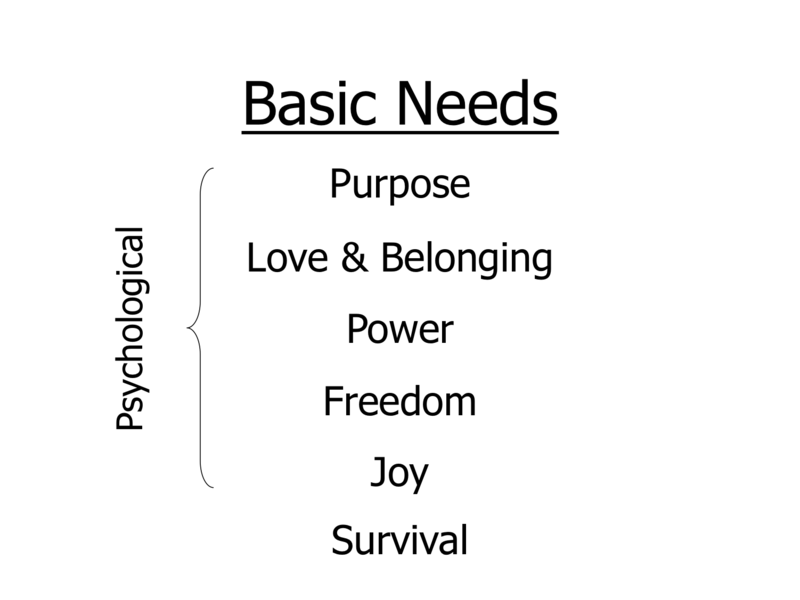 My list of basic needs looks slightly different and includes – Purpose and Meaning, Love and Belonging, Power and Achievement, Freedom and Autonomy, Joy and Fun, and Security and Safety. I invite you to add to this list. What Scriptures have you found that support the basic needs? Comparing the behavior of God in the Old Testament to His behavior in the New Testament has challenged the thinking of theologians for centuries. There seems to be such marked differences between the two, yet we know that the same God was centrally involved both before (during) and after the Cross. Why the difference? Heresy, you may say, but hold on. I actually got this idea from Jesus. A significant section of the Sermon on the Mount (Matt. 5:21-48) is devoted to Jesus pointing out that “You have heard that the law says . . .” whereupon He comments on things like anger, murder, adultery, divorce, vows, vengeance, and relationships. After stating what the Old Testament law supposedly demanded, He surprises us by continuing with ” . . . but I say unto you . . .” whereupon He shares a much different response, a decidedly different way of being. Don’t return violence for violence, he encourages, but instead give your cheek to be slapped if that will help. Don’t only want to be in relationship with friends, he offers, but instead behave in a way that will even show love to people you consider to be your enemy. Jesus, who is the God of the Old Testament, must have had a huge challenge communicating with the human race. I think we really don’t understand the gulf that sin created between us and heaven. Only God coming to our little outpost called earth, and showing us who He really is and what He is really like, would begin to shed light on the events of the Old Testament. As a result of sin, the gulf between earth and heaven was wide, and our ability to commune with God directly was broken. Not severed, but seriously damaged. God’s primary language, which is love, became foreign to us. Communication was an issue. Some of the Bible writers seemed to get this language of love; others not so much. A passage in Genesis is relevant here. I don’t think that God reached down and forced pharaoh to be obstinate. Most of us agree that God simply knew in advance how pharaoh was going to react to Moses’ demands. This seems to be an example of the kinds of misleading passages sometimes found in the Old Testament. Bible writers said it the best way they knew how, and maybe said it in the way they thought their hearers or readers would understand, but something was lost in the translation. Many Bible writers did “get” God’s love language, though, and the Old Testament is full of such examples. Take, for instance, a passage from the Psalms. Listen to me, O my people, while I give you stern warnings. For it was I, the LORD your God, who rescued you from the land of Egypt. But no, my people wouldn’t listen. Israel did not want me around. So I let them follow their own stubborn desires, living according to their own ideas. This description reveals a God anxious to fill people with good things, and hurt and frustrated that His people didn’t even want Him around. Instead of fire and brimstone and threats and punishment, it simply says then He let us follow our own stubborn desires and live according to our own ideas. To me, this writer is capturing a more accurate picture of God; a picture that emphasizes His love for us, and at the same time reminds us of our ability to either embrace Him and what He stands for or to tell Him to take a hike. And even in the midst of our telling Him to take a hike, He continues to love and support us; to seek us out; to save us. Language is important. And the words we choose are important, especially so when they depict the character of God. An obvious theme throughout scripture is the theme of choice. God created us with the ability to choose and He has sought to maintain that freedom from the beginning. Let’s keep this theme in mind as we read the messages of scripture. Of all our choices, this really is the ultimate choice.